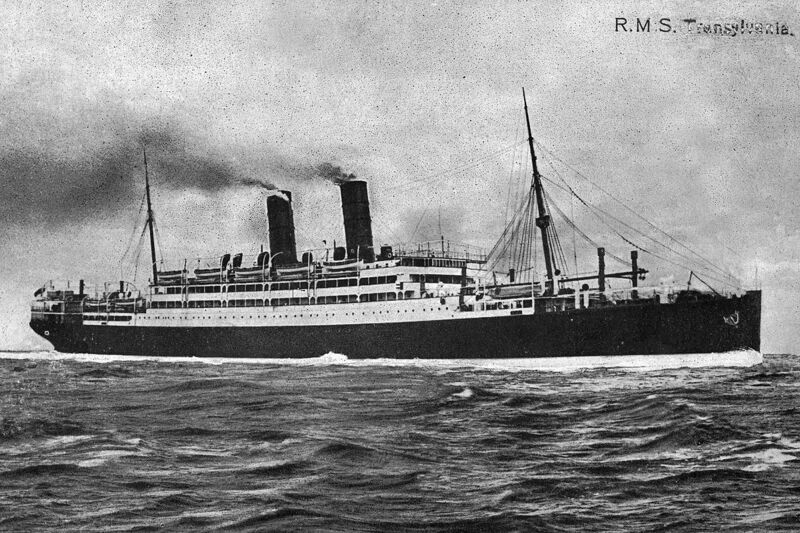 The hired transport Transylvania (Lieutenant S Brennell killed), of 14,315 tons, is torpedoed off Cape Vado, a few kilometers south of Savona, Italy by the German submarine U-63. The Japanese destroyer Matsu comes alongside the Transylvania and begins to offload the troops while the destroyer Sakaki circles in an attempt to force the submarine to submerge. After a second torpedo strikes the ship the Transylvania sinks immediately. There are three hundred ninety-eight military casualties in addition to the twelve members of the crew killed (the Master included). Trooper James Werner Magnusson (Auckland Mounted Rifles) is on the deck when Transylvania is torpedoed and sees an injured soldier struggling in the water. He immediately dives overboard and although there is a very rough sea he swims to the soldier’s assistance and succeeds in placing him in a boat. Magnussen then returns to the sinking ship and drowns when the ship goes down. For his actions he will be posthumously awarded the Albert Medal. Major Thomas Hubert Barclay (Surrey Yeomanry) dies from exhaustion after saving many lives in the sinking of H M T Transylvania for which he will be awarded the Board of Trade Silver medal for saving life at sea posthumously. He dies on board an Italian tug boat after spending three and a half hours in the water at age 33. His brother died of wounds last January in East Africa. Chaplain the Reverend John Thomas Craig Ireland is killed in the sinking at age 45. Captain Charles Alfred Whiting Pope (Royal Army Medical Corps) is killed in the sinking at age 39. He is the son of Alfred Pope JP and one of eleven brothers and four sisters, all of whom (except on brother predeceased) fought or worked for their country in the Great War. One brother was killed in October 1915 another will die on service in April 1919. His son will be killed as a Pilot Officer in the RAFVR when he is shot down off Corunna in September 1942. Lieutenant John Vivian William Eccles (Lancaster Regiment) drowns. He is a member of Coombe Hill and Acton Golf Clubs and was the winner of many prizes in competition. Second Lieutenant Guy Charles Dunlop Hill (Shropshire Light Infantry) is killed at age 26. He is the son of Admiral G W Hill. Second Lieutenant Claud Norie-Miller (Army Service Corps) is lost at age 32. He is the son of Rancis Norie-Miller JP Baronet and MP in 1935. Private Percy Wagg (Cheshire Regiment) dies of wounds at sea at age 20. His brother died on service in Egypt in November 1915. Lieutenant Colonel James Henry Haughton Chadwick DSO (Manchester Regiment) is killed when he is hit by shell fragments at Bullecourt at age 36. He had gained a double first at Cambridge and was a lecturer at London and Bristol Universities. Lieutenant Frank Clifford James (Berkshire Regiment) is killed in action at age 19. He is the son of the Reverend Henry Price James Vicar of Mynyddislwyn. Chaplain Edgar Charles Houlston died at sea at age 25. Chaplain Webster Henry Fanning Harris (attached Canadian Infantry) dies of wounds in London received in September 1916 on the Somme. Second Lieutenant Richmond Gordon Howell-Price MC (Australian Imperial Forces) is killed in action at age 20. He is one of three brothers, all winners of the Military Cross, killed within one year during the Great War. They are sons of the late Reverend John Howell-Price. Lance Corporal Philip Lewis Groom (King’s Royal Rifle Corps) dies of wounds at age 25. He is a ballet master and his brother will be killed in September. Private Ansell Vere Searle (Berkshire Regiment) is killed at age 20. His brother was killed in September 1915. Sapper Joseph Bernard Baylis (Royal Engineers) is killed at age 28. His brother will die of wounds September of this year. Private Albert E Bakewell (Warwickshire Regiment) is killed. His brother was killed last July. Private Ralph Bridgstock (Sussex Regiment attached Machine Gun Company) is killed at age 21. His brother was killed last September. Private Harry Smithson (East Yorkshire Regiment) is killed at age 33. His son will lose his life in the Second World War.